19. Gerry and The Pacemakers - How do you do it? 20. Blue Mink - Melting Pot. ????????????? ??????? ?????? : ?? ?????????? ???? ????? : ?? ????????????? ?????????? C2 : ??? ??????????? ?????? ??????? Lead-in ? Lead-out : ??? ?????????? ??????????? ??????? ??????? : ?? ???????? ?????? ? ??????? ? ?????? ? ????? : ??? ??? ??????????? CRC ?????????????? ??????? ?????? : ?? ???????? ?????? : ???????????????? ?????????? ???? | ????? | ???????????? | ????????? ?????? | ???????? ?????? ?????????????? ????????? ?????????? ? ????????? ?? ??????? 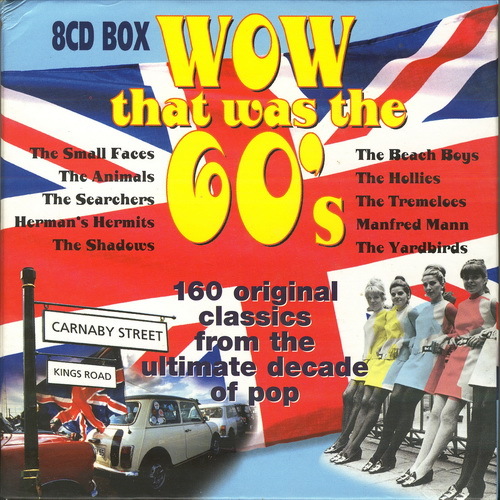 TITLE "Wow, that was the 60's (CD1'8)"
PERFORMER "Johnny Kidd and The Pirates"
TITLE "Walking back to happiness"
TITLE "Will you love me tomorrow"
PERFORMER "Tommy Bruce and The Bruisers"
TITLE "Michael row the boat ashore"
TITLE "Up on the roof"
TITLE "How do you do it?" PERFORMER "Gerry and The Pacemakers"
TITLE "WOW, that was the 60's (CD2'8)"
TITLE "If you gotta make a fool of somebody"
PERFORMER "Freddie & The Dreamers"
TITLE "Do you want to know a secret"
PERFORMER "Billy J. Kramer & The Dakotas"
TITLE "The night has a thousand eyes"
TITLE "Johnny comes marching home"
TITLE "I'll never get over you"
TITLE "You'll never walk alone"
TITLE "WOW, that was the 60's (CD3'8)"
TITLE "You were made for me"
PERFORMER "The Swinging Blue Jeans"
TITLE "Baby I need your lovin"
PERFORMER "Cliff Bennett & The Rebell Rousers"
TITLE "A world without love"
TITLE "Don't let the sun catch you crying"
TITLE "Talk back tremblin' lips"
TITLE "I'm telling you now"
TITLE "The house of the rising sun"
TITLE "WOW, that was the 60's (CD4'8)"
TITLE "I'm into something good"
TITLE "Don't throw your love away"
TITLE "Ferry across The Mersey"
TITLE "Anyone who had a heart"
TITLE "Leader of the pack"
TITLE "I understand (just how you feel)"
PERFORMER "Freddy & The Dreamers"
TITLE "WOW, that was the 60's (CD5'8)"
TITLE "Don't let me be misunderstood"
TITLE "If you gotta go, go now"
TITLE "To know you is to love you"
TITLE "Trains and boats and planes"
TITLE "The sound of silence"
TITLE "You're my world (il mio mondo)"
TITLE "The carnival is over"
TITLE "Got to get you into my life"
PERFORMER "Cliff Bennett & The Rebel Rousers"
TITLE "We've gotta get out of this place"
TITLE "A must to avoid"
TITLE "WOW, that was the 60's (CD6'8)"
TITLE "Bang bang (my baby shot me down)"
TITLE "The house that Jack built"
PERFORMER "Simon Dupree & The Big Sound"
TITLE "It won't be wrong"
TITLE "There's a kind of hush"
TITLE "Excerpt from a teenage opera"
TITLE "Hi ho silver lining"
TITLE "WOW, that was the 60's (CD7'8)"
TITLE "Let's go to San Francisco"
TITLE "Even the bad times are good"
TITLE "The first cut is the deepest"
TITLE "I've been a bad bad boy"
TITLE "Mrs. Brown you've got a lovely daughter"
TITLE "Thank u very much"
TITLE "I can't let Maggie go"
TITLE "On the road again"
TITLE "Various - WOW, that was the 60's (CD8'8)"
TITLE "Humble Pie - Natural Born Boogie"
PERFORMER "Humble Pie - Natural Born Boogie"
TITLE "Amen Corner - (If Paradise Is) Half As Nice"
PERFORMER "Amen Corner - (If Paradise Is) Half As Nice"
TITLE "Small Faces - Lazy Sunday"
PERFORMER "Small Faces - Lazy Sunday"
TITLE "Fleetwood Mac - Man Of The World"
PERFORMER "Fleetwood Mac - Man Of The World"
TITLE "The Tremeloes - (Call Me) Number One"
PERFORMER "The Tremeloes - (Call Me) Number One"
TITLE "Bonzo Dog Doo-Dah Band - I'm The Urban Spaceman"
PERFORMER "Bonzo Dog Doo-Dah Band - I'm The Urban Spaceman"
TITLE "Peter Sarstedt - Where Do You Go To My Lovely"
PERFORMER "Peter Sarstedt - Where Do You Go To My Lovely"
TITLE "The Foundations - Build Me Up Buttercup"
PERFORMER "The Foundations - Build Me Up Buttercup"
TITLE "Lulu - Boom Bang-A-Bang"
PERFORMER "Lulu - Boom Bang-A-Bang"
TITLE "Herman's Hermits - My Sentimental Friend"
PERFORMER "Herman's Hermits - My Sentimental Friend"
TITLE "Tommy James & The Shondells - Mony Mony "
PERFORMER "Tommy James & The Shondells - Mony Mony "
TITLE "The Band - The Weight"
PERFORMER "The Band - The Weight"
TITLE "Canned Heat - Goin' Up The Country"
PERFORMER "Canned Heat - Goin' Up The Country"
TITLE "Joe South - Games People Play"
PERFORMER "Joe South - Games People Play"
TITLE "Jimmy Cliff - Wonderful World, Beautiful People"
PERFORMER "Jimmy Cliff - Wonderful World, Beautiful People"
TITLE "Desmond Dekker - The Israelites"
PERFORMER "Desmond Dekker - The Israelites"
TITLE "Amen Corner - Hello Susie"
PERFORMER "Amen Corner - Hello Susie"
TITLE "Paul Jones - Aquarius"
PERFORMER "Paul Jones - Aquarius"
TITLE "The Beach Boys - Do It Again"
PERFORMER "The Beach Boys - Do It Again"
TITLE "Blue Mink - Melting Pot." PERFORMER "Blue Mink - Melting Pot."